McDonough Marketing Communications has celebrated winning New Business of the Year at the Sunderland Echo Portfolio Awards. 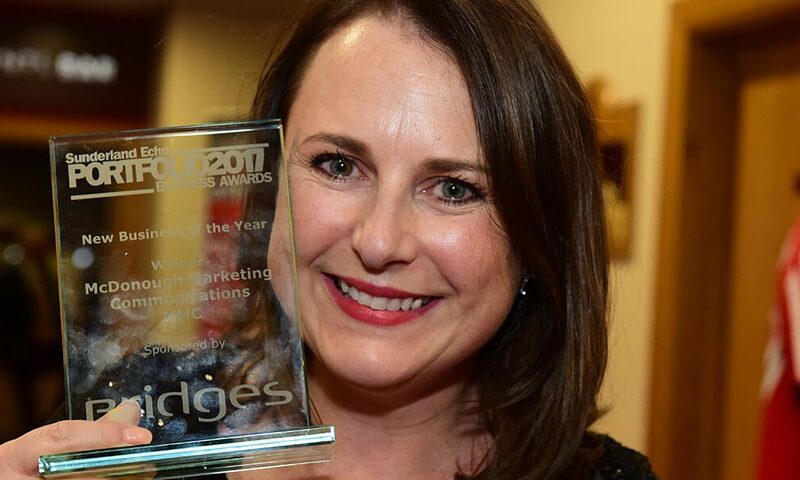 Sponsored by The Bridges, the award was collected by the company’s MD, Natasha McDonough, at the Stadium of Light event. Based at the Sunderland Software Centre, the strategic and digital marketing company was set up by Natasha – an established Marketing professional who has extensive experience of running global marketing campaigns – to fill a gap in the market for marketing strategies that focus on lead generation. The company is now a team of three and works closely with specialist associates for SEO, PPC, design, web and branding. The associate model is appreciated by clients due to bringing in a group specialists that deliver marketing strategies. “In less than two years since making the decision to move into the Software Centre, the company has grown and we’ve built up a reputation for advice and expertise that delivers. Our reputation has led to us now working with national and international brands, the public sector and a number of the region’s vibrant and growing SMEs” says Natasha McDonough. Learn more about McDonough Marketing Communications here.